Water is an essential resource for every living being. Nevertheless the drinking water resources decreased in the last decades and the pollution of water increased while in many parts of the world water scarcity is a big problem. 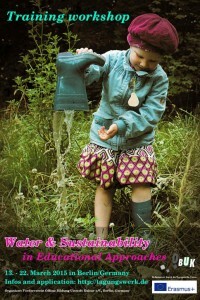 Effective Concepts of sustainable water consumption are more important than ever. Our training workshop „Water & Sustainability in Educational Approaches“ took place from 13.-22.March 2015 in Berlin/Germany, focusing on different ecological, economic, political and social aspects of the topic water. Together with youth workers & trainers from Germany, Romania, Portugal and Italy we tried out and evaluated different interactive pedagogical approaches/methods, which enable us to integrate the topic water & sustainability in our future daily pedagogical work. The aim was to sensitize our learners with these attractive methods for this topic and motivate them, to become active by themselves in future. The training was funded by the European Union’s Erasmus+ programme.